On Friday, July 13th, Commodores players Davis Sims, Jack Little, and Maverick Handley, along with intern Haley Reierson, visited Cape Cod Five Cents Savings Bank. While there, they signed autographs and took pictures with fans, including some visiting all the way from Ireland. The ‘Dores also enjoyed ice cream while at the bank, and would like to thank Cape Cod 5 for being such a wonderful sponsor! June 2018: Teaticket Elementary School — Commodores Declan Cronin (College of the Holy Cross), Scott Politz (Yale University), and Will Brennan (Kansas State University) and interns Eliza Laycock (Amherst College) and Hayley O’Connell (University of Connecticut) attended the fourth-​grade field day at Teaticket Elementary School on June 21. Throughout the morning, Cronin and Brennan led two separate baseball games while Politz played Pickle with the students. The three classes rotated between the stations, getting a chance to interact with each of the players. As the event ended, the Commodores signed baseballs, mitts, and t-​shirts for several eager students. 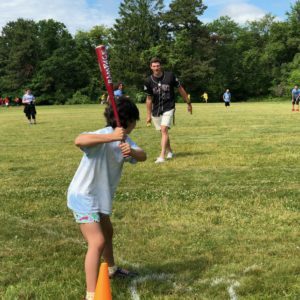 June 2018: Morse Pond Field Day — The Falmouth Commodores attended Field Day at the Morse Pond School on June 19th. Annie Clauden, Mike Murray, and James Fitzpartrick were the interns that attended, and the players that attended were Nick Mikolajchak and Jonathan Miller. The day was for the sixth grade classes and there were various games set up for the students to participate in. Everything was organized extremely well and the teachers/​volunteers made sure all the classes were moving according to schedule to ensure that everyone got to play each game. The interns helped out with the 40 yard race and the football distance throwing game. The players helped out with the kickball game. All the kids seemed to be having a great time and they looked like they were enjoying everything going on. June 2018: Strawberry Festival — On Saturday some of the Falmouth Commodores players and interns and board members attended the local strawberry festival at St Barnabas Church. The players that attended were Zach Stromberg (Boston College), Patrick McGowan (Holy Cross), Declan Cronin (Holy Cross), and Ian Koch (Western Illinois) along with Commodores interns Mark Soma (Miami OH) and Anthony Rorres (Alabama) and Kevin Fitzgerald a board member. They met and talked with fans, took pictures, and enjoyed themselves at the festival. June 2017: Nice lunch with Atria residents including Al Irish and Falmouth Commodores players Cam O’Neill, Jordan Gubelman, and Brian Gadsby. 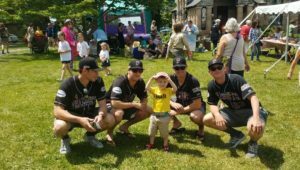 June 17, 2017, 1st year players for the Falmouth Commodores, Connor Eason and Zeke Dodson, enjoy a day in Falmouth at the Strawberry Festival interacting with local fans. After a bowl of strawberry shortcake they met up with some future possible Commodores and spoke with Cape Cod natives about what it’s like to live here year round. Eason is a rising Junior at the University of Florida and Zeke as well is a rising Junior but at Lipscomb University. The Falmouth Commordores enjoyed a nice morning at the Waquoit Congregational Church on Sunday, June 18, 2017. Representing the team were players Dalton Feeney, Tyler Bloom, Packer McFadden, Robbie Peto, Marty Bachina and Clayton Daniel. Along with the players some of the Commordores staff/​interns joined them including Mark Kasprzyk, Eric Zmuda, Deb Brocklebank, Justin Powell, Jack Travers, Bobby Smieszny and Kate Fisher. The service was filled with baseball songs, cracker jacks and 9 innings. On July 28, 2016 — Players Jake Brid, Jeff Passantino, and Micheal Cantu join interns Alex Fern and Chloe LeBouf at summer camp at the Falmouth High School. JJ Matijevic, Willie Burger, Brady Puckett, Micheal Cantu, Jeff Passintino, Thomas Ponticelli and Brendan King greet Falmouth Youth Baseball before the June 26, 2016 Commodores game. Falmouth Youth Baseball provides organized baseball to over 200 boys and girls ranging in age from 8 – 12 years old. Support from local sponsors, parents and volunteer coaches have helped develop Falmouth Youth Baseball into one of Cape Cod’s largest and most respected baseball programs. Willie Burger, Michael Cantu, Brady Puckett, Ryan Chandler and Steve Villines welcomed the Challenger Club to Guv Fuller field June 18, 2016. The mission of the Challenger Club is to enrich the quality of life for children and young adults with physical and/​or developmental disabilities by providing them with the opportunity to participate in a variety of athletic, recreational, and social activities that are most often not available to them under typical circumstances. Commodores team. We are very lucky to have the bank as such a great sponsor! *On June 19th, 2016, Commodores players, board members, interns and volunteers once again joined in worship at the Waquoit Congregational Church. A typical Sunday service might have been expected by our players Ryan Chandler (Rice), Paul Balestrieri (Cornell), Brendan King (Holy Cross), as well as Matt Duce and Seth Elledge (Dallas Baptist), but they were in for a bit of a surprise. Baseball Day, led by Reverend Nell Fields, featured a service that included cracker jacks, the singing of Sweet Caroline, and a fantastic sermon about the score not telling the story, both in baseball and life. It concluded with players having an opportunity to meet attendees, sign autographs and hear many great baseball stories from generations past. *For a few seasons now, we have enjoyed participating in the Morse Pond 5th and 6th Grade Field Days. This continued this year for both grades and we were happy to come back on June 16th and June 17th, 2016. As an example, Brady Puckett and Jeff Passantino (both of Lipscomb University) joined Morse Pond Middle School for their 6th Grade Field Day. They helped work the Farthest Throw competition as well as the 60 Yard Dash as the kids competed with their classmates. Our players enjoyed their time as they ran around catching footballs and chatting with the kids. 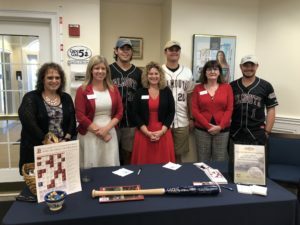 * On July 31st, 2015, JB Woodman (Ole Miss) and George Brandecker (Pittsburg State) of the Commodores had a great morning visiting with employees and patrons at the Falmouth branch of Rockland Trust. They enjoyed chatting with everyone who stopped by during a busy day of errands and spent some time visiting with our “boys of summer” as well as discussing our team’s place in the community. We hope to visit again soon! * Three players from our Falmouth Commodores, Boomer White, Tristan Gray and Ben Ancheff made their way to Hyannis on July 10th 2015 for the 4th annual Cape Cod Baseball Day. The players (along with reps from the 9 other CCBL teams) signed bats, baseballs, hats, and made fans smile. Each year, 3–4 players from each team in the league come out to gives fans an experience that they can’t get in anywhere else, a chance to meet top prospected players before they make the next step to a professional career. * On July 5th, 2015, Closer Stephen Villines and Catcher Michael Tinsley (both of the University of Kansas), stopped by the Carousel of Light at Mullen Hall Elementary School to play catch with fans and have a little ice cream provided to all patrons courtesy of Pies a la Mode. The duo from KU talked to the kids while playing catch and may even have convinced some to play ball when they grow up. The boys even had a special treat when they had the opportunity to meet and converse with a “Rock Chalk” alum. A ride on the carousel later and a few signed balls and gloves made the morning all worth it to talk with these lucky fans. * Coaches Stoll and Marder, along with JJ Matejevic and Andrew Snow, visited Morse Pond Middle School on June 16th 2015 for 5th Grade Field Day. for 6th Grade Field Day. The players and coaches interacted with students as they engaged in kickball, capture the flag and other games on a couple of beautiful mornings in Falmouth. We enjoyed taking part in this great event for the second year in a row and look forward to coming back again! * On December 7th, 2014, the Commodores Board and volunteers entered a float into the 51st Annual Falmouth Christmas Parade. In only our second attempt, we snagged a First Place Trophy! Congratulations and a huge thank you to everyone who staged, set up, rode on and broke down the float this holiday season. We are all very proud to be a part of such a great parade! The Commodores are honored and pleased to support the Falmouth Service Center with ongoing donations throughout the year, especially during the holiday season in November and December. We are happy to assist in our small way with providing some comfort and joy to neighbors in need.